Therapy dogs share unconditional love with everyone they meet. If you know a special therapy dog, then these gift ideas may be the perfect way to say thank you to that special pup and his/her handler. This post may contain affiliate links, which means at no additional cost to you, I may earn a small commission if you click through and purchase something. Please see my Affiliate Link Disclosure policy for more details. 1. A Therapy Dog Sew-On Patch makes a practical gift for any therapy dog team. Help avoid confusion with service dogs by identifying therapy dogs as the unique healers they are. With five different sizes to choose from, Creative Clam makes it easy to pick the perfect size for a harness, doggie jackets, or tote bag. 2. A Therapy Dog Iron-On Patch may work better for handlers who don't sew. While this patch comes in only one size (3" x 3"), the "Pet Me" message invites those around the therapy dog to soak up the love! Also, the instructions provided by Your Patch Store for applying the iron-on patch are clear. 3. The Therapy Dogs Are Life Savers Dog Paw Magnet is another inexpensive option to recognize the importance of the work therapy dogs do. This magnet works on a variety of metal surfaces including cars and trucks. The UV coating helps the magnet resist fading. These magnets from DoggyStylGifts are packaged by persons with disabilities as well. What therapy dog team wouldn't love that? 4. This My Therapy Dog knows how to HEAL sticker beautifully illustrates how therapy dogs touch so many lives. If you know a therapy dog team who regularly visits hospitals, rehabilitation facilities, or assisted living residents, they will love showing off their work with this vinyl sticker. Also, dog lovers of all kinds should visit Blakdogs to see their other doggy stickers. 5. This Personalized Dog Scarf Dog Bandana is sure to make anyone smile with its punny announcement: The Dogtor is in! You can choose from eight colors, and six different sizes. Be sure to check out all of the beautiful bandanas available at Three Spoiled Dogs to find other dog scarves to fit your dog's personality. 6. A Traveling Roll Up Dog Mat is a fantastic accessory for any therapy dog. This portable dog bed is 1/2" thick to make it easy to roll up. Handlers can use this mat to designate "Place" to keep the therapy dog in one location, especially helpful in situations like children reading to a dog. Six Tails offers this mat in four different sizes. Order early though. This handmade mats take four weeks to make. 7. 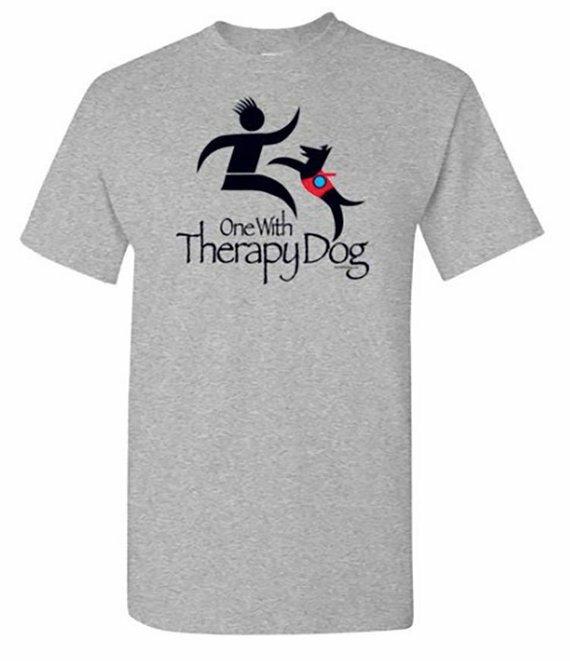 This One With Therapy Dog unisex t-shirt comes in six different colors. The minimalist design paired with a message of love and dedication is sure to thrill any therapy dog handler. While the product selection at this newer Etsy shop is small, One With Dog's designs are simply gorgeous. 8. A Therapy Dogs Rock longsleeve t-shirt is another option for therapy dog handlers during cooler months. This longsleeve tshirt is a ladies cut, but a unisex version is also available. Janees Treasures has several other dog-themed t-shirts as well. 9. A Personalized Pet Tote Bag makes the perfect gift for the therapy dog handler who has everything and carries it with them on visits! This roomy bag measures 21 1/2" wide X 15 1/2" high X 6 1/2" deep. Three Spoiled Dogs can personalize this bag with an Instagram handle, name, or monogram.